I have been wanting to read a dystopian novel for a little while. Something different for a change. 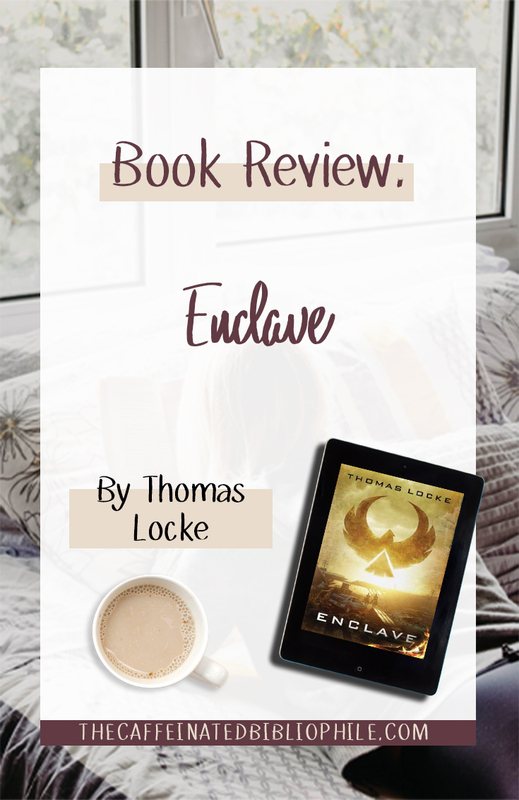 When Thomas Locke came out with a new dystopian series I thought I would give it a go. Nearly a hundred years after the Great Crash, America is no longer America. It is a bunch of “enclaves”. Each enclave has a specific role/industry. I found it to be similar to Hunger Games in that aspect minus the games part. What I did like is that Thomas didn’t really explain what the Great Crash was - just enough to know that it devastated the country enough that America crumbled. It leaves it up the readers imagination and interpretation to what happened. Catawba is one of the largest Enclaves and the people are starting to hear of a group of people who have abilities. These people have abilities like reading minds, healing others, etc. Which I could find similar to certain stories from the Bible. Caleb is a young man who lives in Catawba. One day when there is a dispute among families he finds out that he has an ability to tell whether something bad is going to happen - and others find out. So he must flee the enclave. Kevin is a sherif deputy. Secretly he and his mother are brining refugees across to other Enclaves through the Underground railroad. However, he is caught by the government and given a choice. Either his family and himself get executed or he captures those that have special abilities and brings them back to the government. Dystopian novels always have a eery feeling. Some can seem a little far fetched but others like Enclave sound realistic. And that is what is freighting about it. The plot line of the story is something that could actually happen. Thomas creates a world that is desperate, devastated, and hopeless. They never knew the world as it once was - only rumors. I found this aspect to be quite depressing. One thing I noted about Enclave, is that it read slow. Slow throughout the entire book. Sometimes a book can pick up after page 100 or so but this one just kept dragging on in my opinion. However, if this is a new series, I could see that maybe Thomas was setting things up for a next book, and maybe the next book will be more action packed. I also noticed that whenever action did occur it was kind of hard to follow. A lot of it just suddenly happened and there wasn’t enough transition to understand completely what was going on. I also noticed as I was reading this book I was lost most of the time. I kind of felt like I was reading the second book in a series and was missing important details. What I found interesting is that God was not mentioned at all throughout this novel. Religion was somewhat mentioned - and I could read themes of it throughout the story. However, it seemed like no one was practicing Christianity or any other religion. If this is a series, I hope that Thomas explores this further in the series because it was kind of confusing. Despite its shortcomings, I did enjoy the story and the characters. I liked Zeke the most. His ability was being a skilled warrior. I admired that he struggled with his ability to be warrior. He felt guilty for the actions he made but also did them to help those he loved. Yes and no. While I didn’t enjoy this book fully, some may like it! Are you a fan of dystopian books? If so, which books/series are your favorites? It’s officially 2019 and I can’t believe it! Who else is excited for the new year?! With that being said, It’s that time of the year to reveal my favorite books from the last half of the year. I have already written a post on my favorite books from the beginning of last year, HERE. This was very hard everyone and it was difficult to narrow down to just these few! 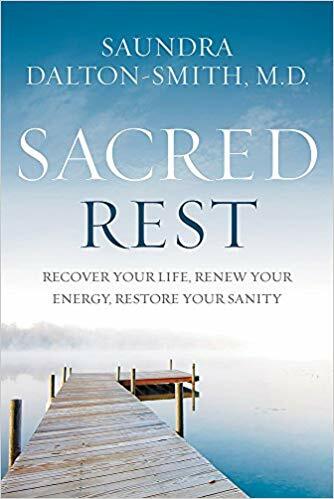 There is a reason why I included this book in my Christmas giveaway. I was blown away by Delia’s debut novel. Yes, this was her debut novel. I couldn’t believe that it was her debut because it felt like she had been writing for years. This book kept me thinking way beyond finishing the book. It’s a book that holds you and inspires you. I would recommend that anyone gives this book a chance! I always adore Lynn’s novels. She is such a talented story teller. Legacy of Mercy was no exception. What I love about Lynn’s novels is that she really has a talent in creating a scene. You are always transported back to a time when things were different and it was a challenge to survive if you were not wealthy. And if you were wealthy you were expected to uphold certain qualities and lifestyle. This is one book I was surprised to like very much. For some reason I was kind of dreading to read this book. However, after just a few pages I was immediately hooked. I think I read this book in just two days time. It was that good! I also loved that she included a woman with Epilepsy - who not only had a mind of her own but had her own reservations and challenges. It made the story more relatable. This book was just plan fun. I always enjoy Tessa’s stories. She creates such a beautiful and inspiring story. Especially a story that we all can relate to on some level. I also really found it neat that Tessa wrote this story for everyone to read - not just Christians. I could definitely see this when reading the book. I think anyone - religious or not would really enjoy and learn from this fun and enlightening story. I have always wanted to visit Yosemite National Park. Karen brought me there just by reading this book. The mystery was intriguing and the love story sweet. I really loved Clark and Olivia’s dynamic and relationship. Though Olivia annoyed me at first, she grew on me and I liked her character by the end. That’s what I liked about Karen’s books - is that her characters were well developed - and she also made me yearn to visit Yosemite! Connilyn knows how to write a story. Her second book in the Cities of Refuge series did not disappoint and I flew through this book over just a couple days. Her books are always richly described, characters well developed, and plot well thought out. If you love a good Biblical fiction story you need to check this one out! Ok I meant to put this book in the picture but as I was preparing this post I finally remembered what I was forgetting when taking pictures. I had already put down the props so it was too late to re do the picture. A face palm for sure! This book - whew it is one of those books I think I will never forget. Francine has a way of grabbing the reader and engrossing them in a story that they will never forget. This story was richly developed, the characters were so well done that I actually felt for some of them. Even though the story was slightly violent at times, I appreciated how real and raw Francine wrote how cruel the Romans actually were. It’s also a story I could see well translated on screen. 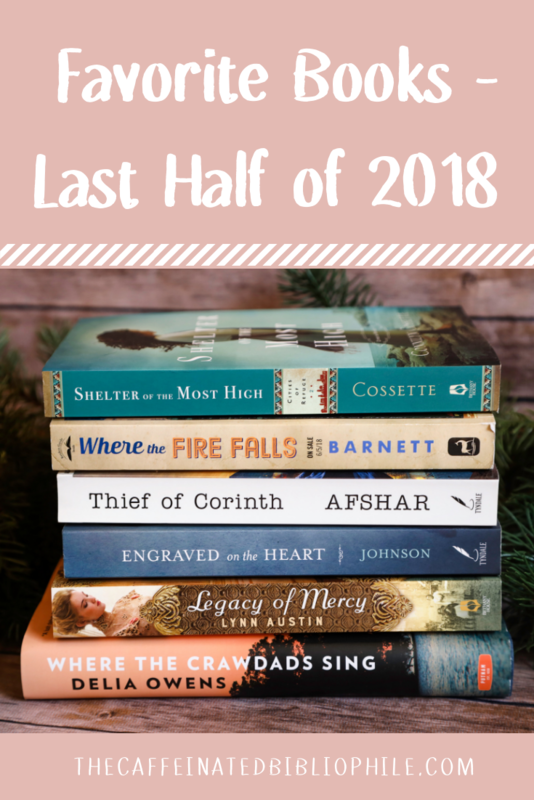 What were your favorite books of 2018? Share in the comments! I was offered to be part of Regina Jenning’s launch team for this book. I absolutely love her books and the humor that she add in her stories. And I was excited to read the second book in the Fort Reno Series since I absolutely enjoyed the first one. Hattie is a young woman that sets off to paint the Rocky Mountains and to hopefully sell the paintings to a gallery. This is her last chance of independence as her parents wanted her to get married rather than pursue a career of painting. As with the times this was very normal so it was interesting to see this story unfold. However, things turn south and her stagecoach is robbed and the agents on the stagecoach are killed. She is left there in the middle of the prairie- and not to mention in the dead of winter. Luckily, the Arapaho find her and rescue her. Jack is a lieutenant at Fort Reno and is assigned to go assist a young woman in distress at the Arapaho camp. There he comes across Hattie, his childhood crush. I mean not just any crush. He thought about her even when they got older and wrote her letters. I thought it was kind of sweet in a way. Jack still holding out a torch for her. Hattie has to be released from the Arapaho so he agrees to a “ceremony” that releases her to him. However, there is a mix up and they accidentally get married by the Arapaho. Yep, married. When they both found out I found it so funny that they didn’t know what was going on the entire time. Even, if they couldn’t understand the language or traditions wouldn’t they have somewhat guessed what was going on? Hattie was furious and wanted to leave ASAP. However Major Adams (which we are introduced to in the first book in the series), warns Jack that they must keep appearances to keep peace between the tribe and Fort. 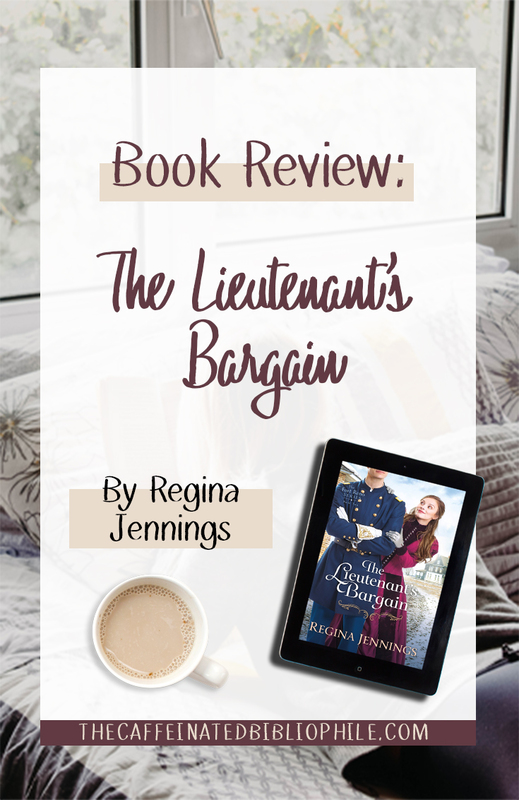 The Lieutenant’s Bargain takes place in the same place as the previous book in the series. So we get reintroduced to the same setting but with different characters. I actually kind of liked this because we get a different perspective of the Fort. This time it felt like it was more isolated and also included more of a diverse set of characters. Which I always appreciate to see! Though this is the second book in the Fort Reno series, you do not need to read the first one I believe. The characters from the first book (Holding The Fort) in the series are included in this story but they are reintroduced. So I don’t think there would be any confusion. In this story we are reminded of what those first few weeks are like when first married. Especially if the couple never lived together prior. It’s awkward, challenging, frustrating at times, but also so worth it in the end. Hattie could have handled it a little better in my opinion. At times, she was very rude to Jack and didn’t give him the time of day. And poor Jack, he was just trying to win her affection the whole time even when they bickered. However, I could see Hattie’s reasoning. I mean, imagine waking up one day and finding out you are married to a person you barely knew! I also liked the diverse characters in this book. In the previous book in the series, the Arapaho seem defensive and dangerous. However, in The Lieutenant’s Bargain we get a closer look at the Fort’s relationship with the Arapaho. We read the struggles the Arapaho had with enrolling their children in a Christian school. They didn’t understand why it was necessary. I was kind of torn on this issue in this book. We all know the history of the Native Americans and what happened. So at the same time, while I believe that it was good that we introduced the Native Americans to Christ, I also agree that they shouldn’t have forced them into almost loosing their culture and traditions. I found it interesting that Regina did include real characters and schools in the book, such as the Darlington Indian Boarding School. While the school no longer exists you can still see it’s ruins near the Fort. And you can also still see and tour Fort Reno today! This story was rather cute and I really liked that there was just more than the issue of marriage at hand. There was still the Stagecoach mystery - and another that is introduced in the middle of the story (no spoilers here!). It was an enjoyable prairie romance and I absolutely enjoyed the humor that Regina always puts in her stories! Yes, most definitely! Regina creates stories that anyone would just about love and enjoy! Note: I am a part of the Regina Jennings launch team for this book. I was sent a copy to review by the publisher. All opinions are my own. This coming Tuesday is the 1st of January. I can’t believe how fast this year has flown by. With that, it’s the most popular time of the year for people to set resolutions. There are so many amazing books out there that will help you with achieving your goals. 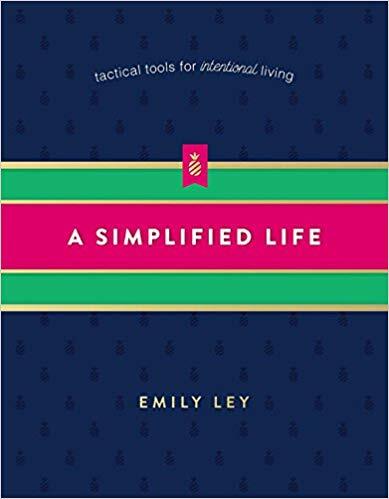 Such as creating a simpler life, living a minimalist life, making time for yourself, etc. As women, we are constantly evaluating ourselves. Am I enough? Why can’t I change this certain thing about myself? Should I be doing more? It’s time to discover who you really are and how you can live life differently. It’s time to meet the new you! Don't worry; you don’t have to be a morning person to start each new day well. Join Kat Lee and thousands of women from countries around the world who have learned to maximize their mornings. 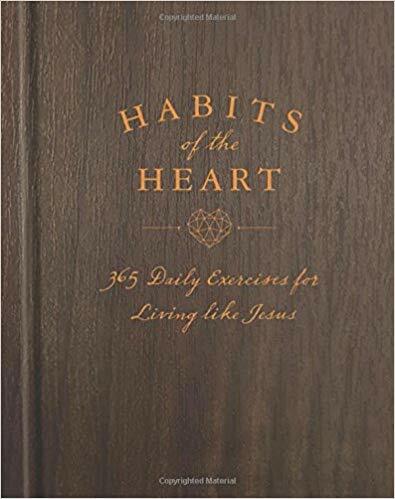 In Hello Mornings, Kat introduces a simple yet powerful three-minute morning routine that integrates Bible study, planning, and fitness into a foundational morning habit that fits into every schedule. She then helps you build each of these core habits for life-long growth. Yay, you made it through! 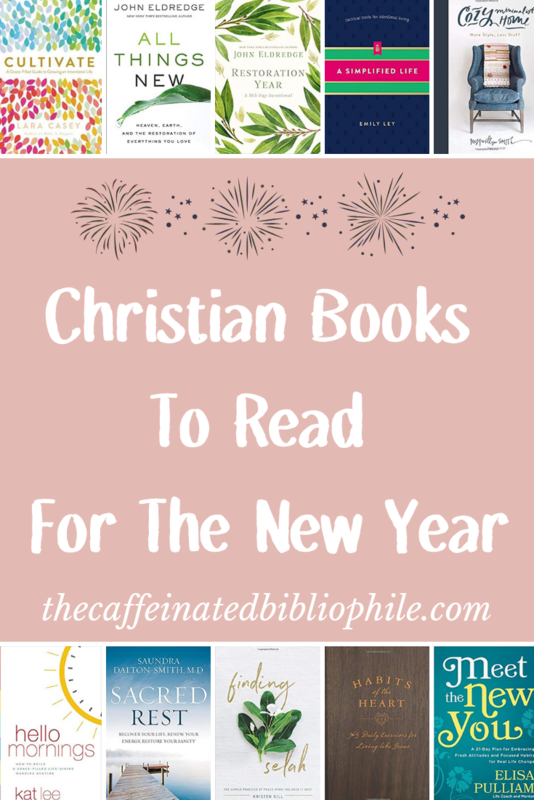 I hope this has helped you find some new books to help you with your new years resolutions. What are your new years resolutions or do you not do them? Share in the comments!